CreateGirl: DWR Sale - The wheels of the bus are in my garden!! DWR Sale - The wheels of the bus are in my garden!! No you don't have to go outside and take your tires off the car...though mine are about ready to be done. Just pop over to DWR for a new take on the wheels that make the bus go round. Design Within Reach is having a super sale on these eco friendly rubber tubs. 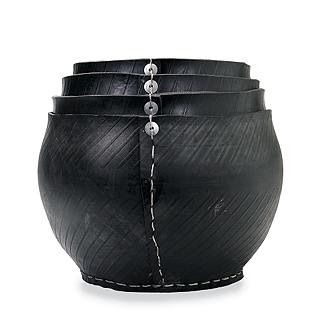 By reconstructing discarded tires they create these fantastic planters/storage bins. 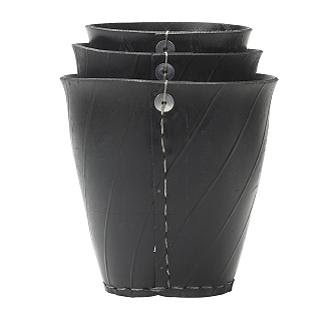 They can be for outside planters (yea tires are durable...) in the summer and indoor storage in the winter! oooh, thanks for the tip--I'm running over there! I know a sale this good doesn't always happen over there! If you buy them let me know how you use them!